In 2008, we set up the Swiss Climate Foundation with a number of partner companies. It was a response to the introduction of the Swiss CO2 law, which provides the basis for the CO2 levy on heating fuels in Switzerland. This levy is not a proper tax but an environmental market mechanism: It imposes a charge on the use of heating fuels and then reimburses the money thus raised – to private companies proportionate to their total salary expenses. For financial service providers, who use relatively small amounts of heating fuel but employ large workforces, this means they receive a total “net reimbursement”. Cups and lunch containers for reuse, not for the waste bin: reCIRCLE is supported by the Swiss Climate Foundation and provides more sustainable containers for convenience food bought on the go. 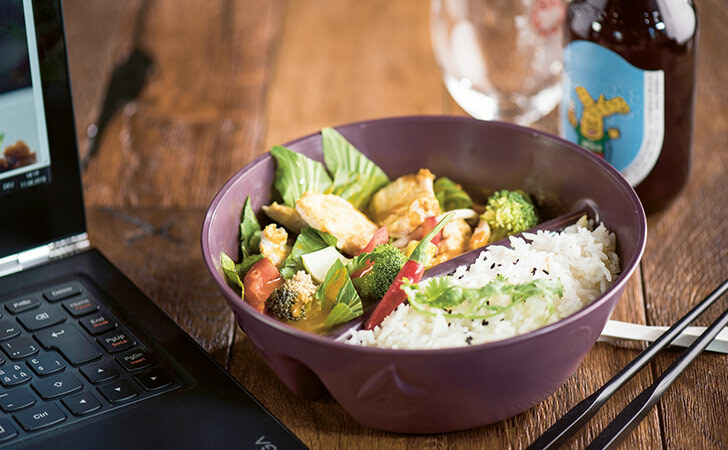 reCIRCLE’s reusable cups and lunch containers are tough enough to last for at least 100 wash-and-reuse cycles, and the company’s goal is to market them through as many takeaway outlets as possible. The purpose of the Swiss Climate Foundation is to collect these funds and to use them to support various climate-friendly projects undertaken by small and medium-sized companies (SMEs) in Switzerland. In 2012, the Swiss Climate Foundation broadened its scope and started to collaborate with the LIFE Climate Foundation Liechtenstein, generating more partner companies and enabling SMEs in Liechtenstein to benefit from the funds, too. By the end of 2016, 28 renowned financial service providers from Switzerland and Liechtenstein were partner companies of the Swiss Climate Foundation. Since becoming operational in 2009, the Swiss Climate Foundation has supported more than 1 300 SMEs in Switzerland and Liechtenstein with CHF 15 million in total. In 2016, 219 SMEs were supported with a total of CHF 1.55 million. These projects are expected to help avoid more than 50 000 tonnes of CO2 emissions over the next ten years. In addition to paying our net levy reimbursement, Swiss Re has been sponsoring the Foundation’s managing director position since it was established in 2008.